It’s hard to say why Funny or Die, a site best known for its short comedic videos, decided to make a full-length Steve Jobs biopic. But iSteve—the free, 79-minute humorous retelling of the Apple co-founder’s life—is surprisingly amusing, provided you are both a fan of Apple and of stupid comedy, and presuming you also don’t mind a little profanity sprinkled in for good measure. iSteve stars Justin Long—the actor who wasn’t John Hodgman in the Get a Mac ads—in the title role. 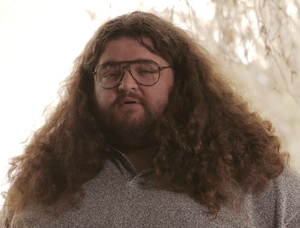 Lost’s Jorge Garcia fills Woz’s dancing shoes (no actual dancing included); and James Urbaniak takes on the role of Jobs’s friend and nemesis, Bill Gates. The film tells the story of Jobs and Woz teaming up to build the original Apple computer, of Apple the company, and of the Mac, the iPod, the iPhone, and, ever so briefly, the iPad. Well, it sort of tells that story. The film—knowingly—gets many, many facts wrong. But it’s sort of like Dave Barry Slept Here or Five-Minute Shakespeare or George Lucas in Love: The better you know the original story, the more entertaining the parody version can be. As Funny or Die tells it, Jobs and Woz’s early friendship was threatened by Bill Gates, with whom Jobs finds a certain kinship. But the two entrepreneurs themselves end up at odds, both in business and in their personal lives: Melinda Gates, here played by actress Michaela Watkins, has relationships with both Gates and Jobs. Despite the movie’s liberties—and there are a lot of them—there is at times a surprising adherence to historical events: For example, the film uses the right date for the introduction of the Macintosh (though it also says it’s Jobs’s 30th birthday). There’s also a scene at the end of the movie depicting Jobs’s celebrated Stanford University address (though the text differs mightily from the original—we’re pretty sure Jobs didn’t mention “midi-chlorians” in his speech). In the end, you might best describe the film as “truth adjacent.” iSteve really does hit on numerous key elements of Apple’s history: There’s the introduction of the Apple II, the development (and dramatic unveiling of) the Macintosh, and even the hiring of Pepsi executive John Sculley. Though, in Funny or Die’s version, Sculley isn’t really a Pepsi staffer at all; he’s a plant sent by a Commodore executive seeking to exploit Jobs’s love of soda in order to take over Apple. 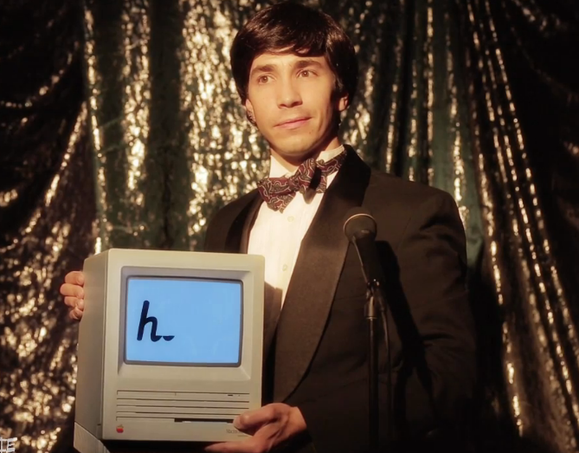 Hi: Steve Jobs (Justin Long) introduces the original Macintosh. The film’s recounting of the time between Jobs’s Apple stints does diverge rather significantly from history: There’s no mention of his subsequent computer company, NeXT, which was eventually acquired by Apple and facilitated Jobs’s return, but there is time devoted to Jobs’s role in developing Pixar, including a lengthy conversation with George Lucas. Lucas, for his part, teaches Jobs the word “prequel” as well as explaining the aforementioned concept of “midi-chlorians,” causing millions of fans of Star Wars and Apple to cry out in pain. Long’s Jobs isn’t a straight-up impression by any means. His take on the character is interesting in part because of the story’s ridiculousness, but also because Long adds a surprising layer of vulnerability to the character. Long’s Jobs isn’t simply a genius, and he isn’t just a jerk: He’s a guy longing for love, and acceptance, and Bill Gates’s wife. Throughout, you may catch a number of choice Jobsean quotes, often from other characters in Jobs’s vicinity, and often skewed in some way. 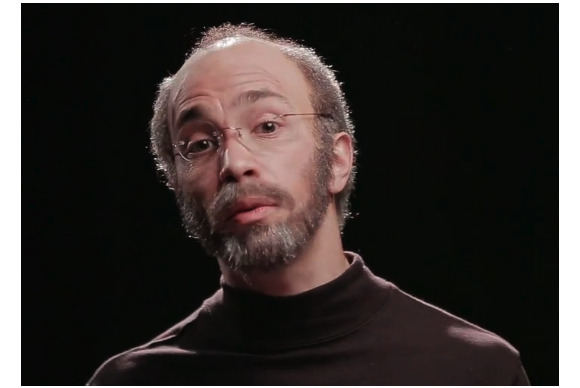 But attentive Apple fans will pick up on references to many of Apple’s ad campaigns, including a “cameo” of Long himself. The movie doesn’t dive into Jobs’s illness, and does take time to include a virtual reality-based love scene, just so you know where its priorities lie. Fans of Apple’s history and, say, the Will Ferrell oeuvre will likely not be disappointed by iSteve. And based on the clips we’ve seen from Ashton Kutcher’s forthcoming Jobs, iSteve is at least one of the top two funniest Jobs-related films of the year—only the Funny or Die effort is intentionally so.